Sometimes skunks invade your house. Their smell permeates your very being - it clouds your happiness and ruins your appetite. Worst of all, the smell can travel home on the shoulders of others who came to visit. Friends who were at your house to frolic and play in a festive wave of sugary delights are now burdened with the same scent removal task. But - strong people move on despite the stench. They spend 14 hours making colourful festive snacks (with time taken out for one feel good movie). They giggle and lick frosting off of their knives. 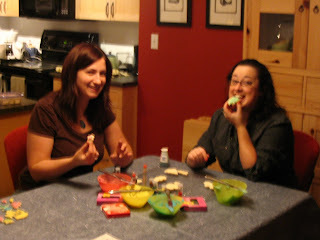 They snicker at each other's creations - and don't forget to taste test the product, numerous times! skunks - what are they really good for? December 17, 2007 at 8:13 a.m.
Wow! If you have a meltdown after making those treats at least it will be worth it! Corina looks great! I know that she isn't the skunk; she just,through no fault of her own, takes on the scent 5 days a week. I hope the kitty cats don't run from her. December 17, 2007 at 11:26 a.m.
mostly i had a good time and the stress and skunks were kept at bay. 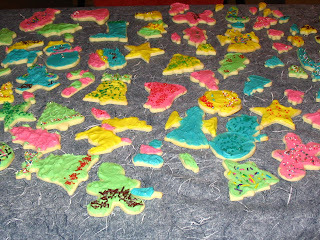 i think that the smell of baking cookies and the sounds of christmas carols definitely overpowered any smell of skunk. i dropped off some cookies at my brother's last night and he 'texted' me minutes later "so good! :-)"